Those who read my texts or attend my lectures know that I often say: “well, everything already happened in the Middle Ages!” This time I will tell you about medieval dislike towards Mondays. 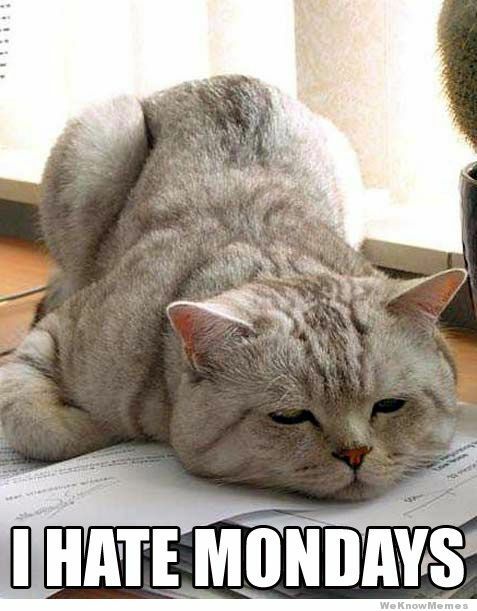 Apparently already in the Middle Ages nobody liked Mondays, and it was especially true for the souls in Purgatory! In the late Middle Ages the most popular books of prayers were so called Books of Hours, which derived from monastic traditions of Officium Divinum (Liturgy of the Hours). Those prayer-books contained various prayers for different hours of the day, for different days or even for different times of liturgical year. 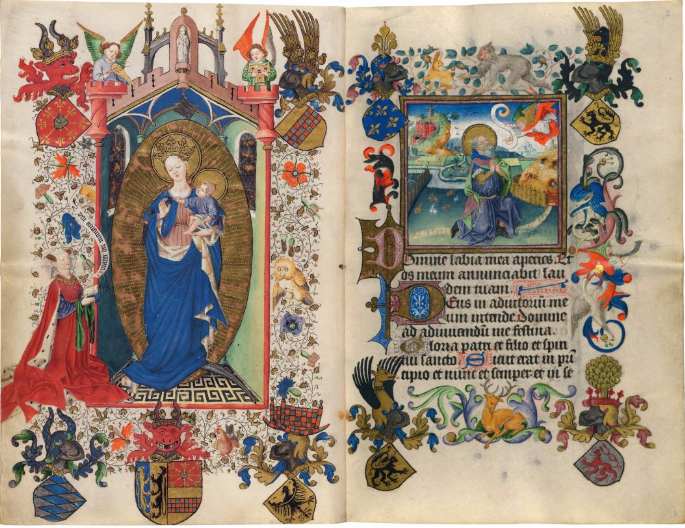 The Books of Hours were also considered as precious objects: it was popular among aristocracy to show off, having richly decorated manuscripts of incredible value. Nowadays the surviving examples are the most precious treasures of the libraries all around the world. One of the best Netherlandish examples are so called Hours of Catherine de Clèves (after 1434, The Morgan Library and Museum in New York, two volumes: M.917 i M.975), decorated with as many as 157 miniatures. The decoration of this manuscript is attributed to the anonymous painter called Master of Catherine de Clèves, who was active in Utrecht in the second third of the 15th century. That manuscript contains many interesting details, but today I would like to focus on Monday motif. In fact, there are particular prayers dedicated only for Mondays in this Book of Hours, and those prayers are for the souls in the Purgatory. 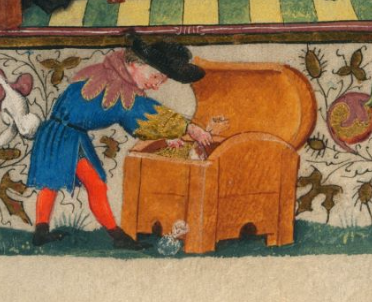 This part of the manuscript is decorated with some very interesting images. 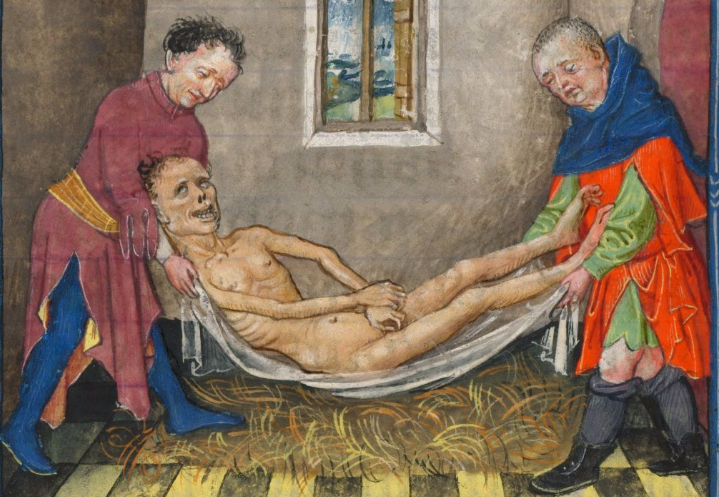 The cycle starts with the depiction of a dying man: he is surrounded by the members of his family, and his wife offers him a candle. There is a doctor standing behind the bed, examining patient’s urine, but basically everyone is aware that this man will not recover. Members of the clergy sit by his bed and pray. But a really interesting scene is happening by the side: a young man, probably dying man’s son, is talking to someone who probably tries to convince him to do something. What is going on here? Well, perhaps we may find the solution of this mystery in the bottom margin of this page. Apparently the son was persuaded to get to the box containing some treasures collected by his father. He probably did it before his father even properly died. But if the father managed to gather some goods, we may suspect that he could have collected them not entirely in a good way… and that means he would have to be punished for his sins. 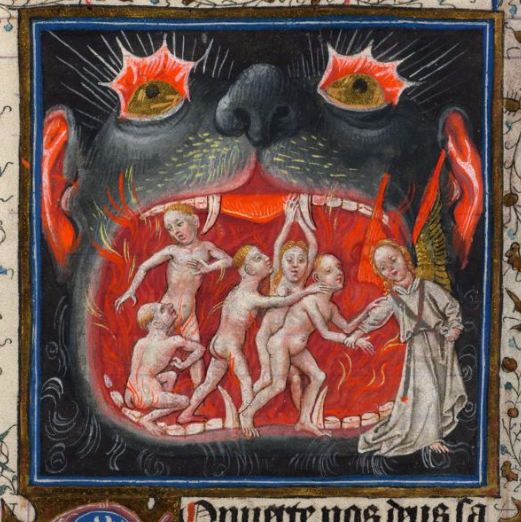 The next page offers a miniature depicting what happens to the souls of common sinners: they get burned in the scary Hellmouth. But that in fact is not Hell; that is Purgatory. It is not eternal and so the living may help out the dead’s souls by offering them regular prayer. Subsequent miniatures graphically explain how helpful we may be for the souls in Purgatory. In one image we may see a mass, probably Mass for the Dead, and an old man offering some bread and wine, placing his gifts at the altar. In the other miniature we can spot the same pieces of bread, brought by the angel to the poor hungry souls in Purgatory. Well, apparently even they have a lunch break! The idea of Purgatory developed gradually, it was defined in the 12th century. Subsequently, it had a huge impact on European late-medieval and early-modern culture and society, not only because there was a pressure on praying for the dead, but mostly because as a result the indulgence trade occurred. But for now let’s get back to the prayers, as it is related to the Monday issue. Why prayers for Purgatory souls were scheduled for Mondays in the Hours of Catherine de Clèves? It was because it was assumed that on Sunday all the torments were suspended, even in Purgatory everyone had their day off! As a result all the souls were very unhappy the next day, when they had to get back to the fire after having a nice break from it. And that is why it was believed that the souls in Purgatory mostly needed our prayers on Mondays. A final miniature of this cycle is an optimistic one: the angel sets free those who completed their penance. It is like a retirement to Heaven. We all look forward to that every Monday.